Drought is always put forward as the main cause of repetitive famines in East Africa, but it doesn’t explain everything. Food production is structurally insufficient, even in years with relatively good rains, partly due to lack of means of production and weak incentives for food producers. Distributing surplus food aid at the wrong time can also perturb local markets and does not inspire sustainable investment in local food production. And the armed conflicts that have affected the area for several decades reduce the populations’ ability to face environmental and climate related challenges. Humanitarian aid is vital in the short term, but it does not tackle the causes of famine. An integrated, regional and inclusive approach is needed. However, a sustainable solution will not come from external actors: the region’s leaders must take more responsibility. End the vicious cycle of armed conflicts and political instability. Put in place government-sponsored agricultural and food policies which attract sustainable investments in order to ensure their implementation. Raise agricultural productivity and develop adaptation and mitigation measures in response to climate change impacts (including means to reduce the vulnerability of the region’s pastoral populations). 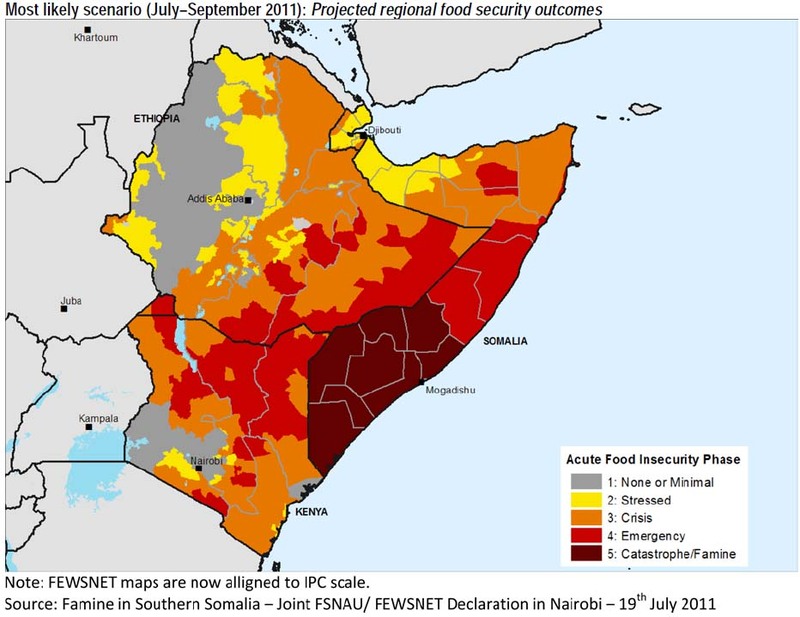 Reinforce the early-warning and alert systems for drought, food security, and armed conflicts. East Africa can draw lessons from the experiences of other African regions, West Africa in particular. Following recurrent food crises in the Sahel, notably from 1973 to 1984, the 1990 Food Aid Charter defined the basic principles to which Sahel countries are committed to and that donors and national authorities share and agree on to avoid the negative effects of aid, thus contributing to food aid effectiveness. Today, the Charter is being revised to respond to the increasingly complex nature of food crises, the arrival of new donors, the stronger impact of the global market, and the rising role of civil society organisations and local actors. The Charter for Food Crisis Prevention and Management shifts from joint food aid management towards prevention and management of crises (mutual responsibility). It clearly affirms the responsibilities of regional organisations and of non-state actors, and enlarges its geographic coverage from the Sahel to West Africa. The Charter particularly insists upon governmental and intergovernmental responsibilities, including seeking sustainable solutions to address the root causes of food insecurity, such as funding half of food security programmes from regional governments and organisations; and making progress towards the realisation of the “right to food” in accordance with national priorities, particularly through the elaboration of legal frameworks, action plans, and their financing. Following a consultation process in the 17 countries that are covered by the Charter, the new text will be approved by an ECOWAS ministerial meeting in September 2011. This West African experience could be a source of inspiration for other regions inflicted with food insecurity. The West African experience also teaches us that a permanent regional dialogue on combating drought and food crises is a way of reinforcing solidarities between peoples and governments. The impact of the Permanent Interstate Committee for Drought Control in the Sahel (CILSS) on the inter-Sahelian policy dialogue is obvious, although it is not quantifiable. Regular meetings between ministries and Heads of State at the regional level in tandem with close collaboration between local and national administrations facilitated dialogue on other issues, particularly security-related ones. From this point of view, Intergovernmental Authority for Development (IGAD) is a precious tool that needs to be preserved and reinforced.